Pledge Nature Reserve is a 10hectare declared nature reserve in the heart of Knysna, easily accessible at only 200 m from the Main road. The effect of leaving the bustle of town, and within minutes, finding the tranquillity of rustling leaves, babbling streams and birdsong, is nothing short of magical. The approximately 5kms of walking trails leads you past the lower-lying ponds, over streams, through forest and fynbos, upwards towards the viewpoint where you can rest and enjoy a stunning view of the Knysna Lagoon and Heads. There are over 300 species of plants and almost a 100 species of birds noted, and it is worthwhile spending some time here to fully explore this local gem. Although the reserve was seriously burnt during the June 2017 fires it is thrilling to observe nature returning with vigour. Our Fynbos section especially, is quickly recovering and we are seeing species that have lain in wait for many years. Unfortunately, many alien invaders are also germinating, so we have our work cut out for us! This year we will focus on the effects these fires had, and will specifically discuss the fascinating regeneration processes we observed. Generally, a guided walk takes between 1 to 2hrs, or more, depending on how engrossed or side-tracked we become! 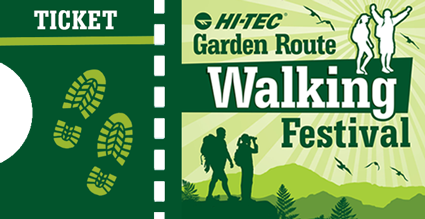 COST: R 20 per adult and R 10 per child – please bring cash to pay your walk leader on the day. Please select the number of bookings you wish to make, by choosing the number of tickets. Price is per person. Visit Hi-Tec online and discover great walking gear. Click on logo for more details.